Raven was always a bench unit until the last redesign at the end of 2017. It was useful in certain situations in specific match ups since Wings of Liberty. Raven is now one of the most important support units in TvT, and it also has utilities in the other two match ups. Mass Raven was an option in extreme late game situations back in Wings of Liberty and Heart of the Swarm, because Seeker Missile and Auto Turret are the most supply efficient options Terran had. Point Defense Drone was crucial in late game air battle. Point Defense Drone was also excellent for mech against bio in Wings of Liberty, as it could neutralise Marauder effectively. Raven was useful in the early stage of TvT, and it was pivotal in gas first build in Heart of the Swarm (e.g., 11/13 and 12/13 gas first Reaper openings). Worth mentioning, Raven was at the centre stage of TvT for a short period of time in 2014 when the double Medivac Auto Turret drop was popular. In sum, despite its unique abilities, Raven was essentially a bench unit unless it was a very late game situation before Legacy of the Void. Raven remained a bench unit until early 2017 in Legacy of the Void. It was the first choice air unit in for 1-1-1 in TvZ (example build), because of Auto Turret was amazing in harassing Zerg’s mineral line. The harassment lasted till the mid game, because Hydralisk was the best tech choice in TvZ at that point of time. Zerg could not clear the Raven that was parked behind the mineral line without a Spire. In response, Blizzard nerf the damage but buff the duration of Auto Turret in patch 3.14, and this gave Zerg more room for counter play. This harassment option was essentially gone when the cast range was nerf from 3 to 1 in patch 4.1.4. In an attempt to push for mech, Blizzard redesigned Raven into a support unit for mech. At that time, I thought the premise was good, but the actual changes were overly optimistic. Of course, it is unfair to be critical of it with hindsight, but it is clear that the redesign did not work as intended. Repair Drone was just bad. But the spotlight was on how Terran simply abused the new Anti-Armor Missile in late game. TvZ was at a bad spot, because there was little counter play to late game mass Raven and Ghost (an example). More importantly, it was atrocious for the audience. 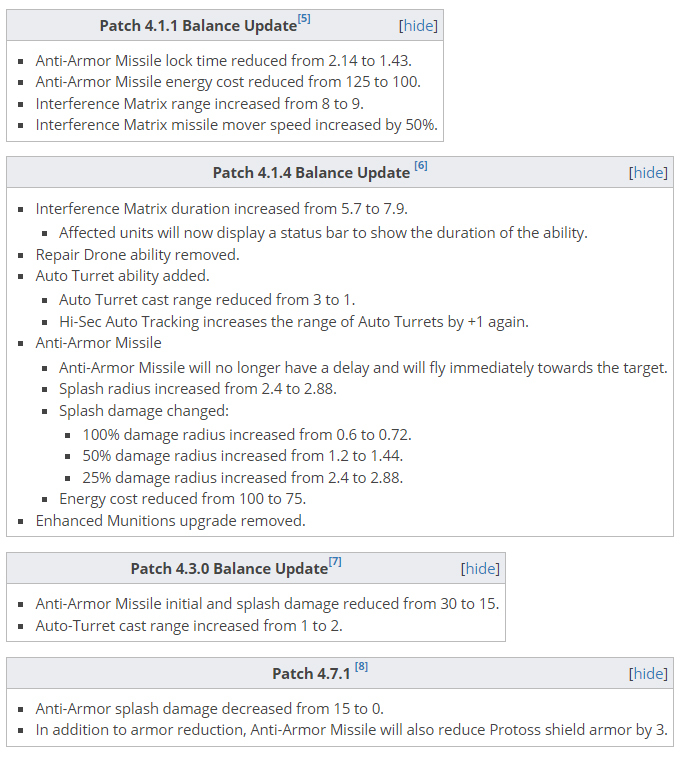 Blizzard nerf Anti-Armor Missile’s damage from 30 to 15 in patch 4.3 as attempt to discourage this play style. However, while the nerf definitely made mass Raven weaker, players still use mass Raven in late game in TvT and TvZ. Anti-Armor Missile’s damage was later nerf to 0 in patch 4.7 to remove this play style completely. Blizzard’s rationale was that, and I quote, “the intent is for Anti-Armor missile to be used as a debuff and not for its damage, we want to emphasize this purity of purpose.” Put it in another way, they want Raven to be used as a support unit in low number, and being mass-able does not align with its intended design. I agree and disagree with their approach in this. I strongly agree that mass Raven was not healthy, and something should be done about it. However, I am not a fan of being too fixate of how units must be used, as it discourages creativity. Below is a list of changes to Raven after the latest redesign in patch 4.0. Raven is least used in TvZ. Recently, going to the extreme late game with the map being closed to mine out is slowly becoming common, and it is unclear who has the advantage if it goes into the late game. The rivalry between INnoVation and Serral accentuated when Serral appeared to not want to play the late game against INnoVation. The story goes along the line that INnoVation defeated Serral by going to the late game at IEM Katowice 2019 in a best of three that did not affect who advance from the group. And then Serral seems to opt for different aggressive builds against INnoVation at the WESG final. Notably, as shown in the late game battle between the two at WESG (see vod below), Liberator, Viking, and Ghost are the main stars in the late game, and Raven is not used. Below vod is the famous game between Maru and Scarlett, and again Raven is not used. Well, a Raven was used to simply reveal the creep, but that was it. Blizzard made it clear that they do not want to see mass Raven, and that definitely does not happen in TvZ. Raven also does not seem to have a place in the early and mid game too for both bio and mech. Overall, Raven does not shine in TvZ. Raven has a unique role in TvP. Broadly, Terran’s strategies in TvP can be categorised into either timing attack or late game, and I have already discussed the rationale behind this in the last article. Unless you want to hit an early 1-1-1 timing (example), Raven is extremely useful for most timing attacks. Interference Matrix could be used on Colossus, and Anti-Armor Missile is effective against Zealot. This is why we see mid game all-in or three base before second and third Barracks builds get a Raven as they power up (for reference). INnoVation almost always gets a Raven in his TvP macro games for the last few months. Below is an example vod. Maru even used Raven and Viking to hunt down Observers in one of his recent GSL semi-final games against Trap. His push in the mid game looked so strong and unbeatable, because Trap did not know the army moved there. See vod below. Raven also has its weakness. Stargate build with Phoenix can make Raven look like a silly choice. Raven is sort of a dead weight against early aggressive Protoss play. The first vod below shows how Raven, with its heavy opportunity cost, basically contributes nothing against an early aggressive build. The second vod below shows INnoVation gave up on getting a Raven once he spotted the Phoenix with the Viking. It is so common that even Polt picked it up immediately when he started playing Starcraft again a few days ago and mentioned that everyone is doing this same strong build. DeMusliM is using this build for every TvT on stream too. Terran players tend to agree that Raven is overpowered in TvT (for reference). See below vod for an example between Maru and INnoVation. Raven is close to flawless defensively early on. The timing of Raven and Cyclone line up well against Cloak Banshee, and this is the biggest reason why Banshee is almost dead in TvT. TvT used to be the match up that we see the most Cloak Banshee, but it is now at the bottom of the three. The damage output of Missile Turret against early frontal push usually is sufficient in shutting the attack down. Raven is also capable of attenuating defender advantage in TvT, and that says a lot. The defender advantage of Tank versus Tank shapes how TvT is played at the fundamental level. Raven’s Interference Matrix allows you to attack into Siege Tanks with equal supply count, and we never have something like this in Starcraft 2. At the casual level, the outcome of the early-to-mid game transition engagement with Raven, Viking, Tank, and other sidekicks is very predictive of the final result of the match. It really depends on who cast the Interference Matrix first and what units are the target. I was previously under the assumption that Raven is only powerful at the early and transition period, but Maru was experimenting it in the mid-to-late game in GSL against Bunny (see vod below). Maru added two more Starport with one on Tech Lab for Raven at around 10:30 in game time. It is not a surprise that Maru transition to prepare for air battle, and this also seems to line up well with his defensive position in the mid game. Anti-Armor Missile can turn the tide of Marine battle, and Interference Matrix is always threatening. Overall, Raven is very strong in TvT. When you look at what Blizzard are trying to do with Raven these few years, the current state is great. Raven fits the support unit role well, as Interference Matrix and Anti-Missile Turret are only useful if you have other units. Most importantly, mass Raven is not effective. Given that Raven is frequently used in TvT and TvP, I think it is okay that Raven is not really used in TvZ. This further suggests it is a support unit. Raven is at a good place in TvP, because it is useful but situational. In TvT, Raven is borderline too strong, but the interaction is interesting and it seems “fair”. By being fair, I mean the unit allows players to demonstrate their skill, and the better player usually comes out ahead of the interaction. I was watching DeMusliM’s stream, and he tried to engage into opponent’s army in the early-to-mid transition time frame by casting Interference Matrix on opponent’s Siege Tanks. The opponent read the situation instantly and cast the Interference Matrix on DeMusliM’s Raven first. DeMusliM basically ran his army into opponent’s defensive position as a result and lost the game. This is where Raven separates itself from the old Cyclone. The old Cyclone was overpowered in the early game TvT, and it dictated every decision you make early on and how you transition to mid game. However, there is little you can do to show that you are a better player, because you mostly just attack move. In conclusion, while Raven is in a good spot overall, its dominance in TvT makes the early game one dimensional. I think Blizzard should keep a close eye on the current state of Raven in TvT.